Facebook has announced that it has started shipping its flagship smart displays, the Portal and the larger Portal+ to customers in the US. The devices are priced at $199 (around £150 / AU$280) and $349 (£270 / AU$495) respectively, and the social media giant is also running a deal that gets you $100 off any two devices. It still hasn't announced when the video-calling devices will be rolled out to other territories, including the UK and Australia. 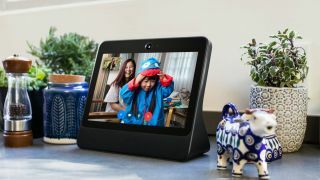 The new devices are part of Facebook's mission to improve video calling by making it "completely hands and distraction free", and use AI technology in tandem with a 'Smart Camera' to follow you around the room as you chat, zooming in on wherever the action is. What kind of data will Facebook collect? Facebook has since promised that it will treat all Portal calls in the same way it treats Messenger conversations – so while it won't view the calls, it will collect data usage, which could in turn be used to generate cross-party ads. Although this may sound alarming, Facebook says it won't be using the contents of your calls to generate adverts – so if you mention that you're buying a new outfit in a Portal video call, you won't then see adverts for clothes shops on your Facebook feed as a direct result. Instead, the type of data Facebook is collecting is mainly concerned with the frequency and duration of calls – how this will affect the ads you see while using the social media site isn't clear. Facebook also claims that all calls are encrypted, and any of the AI tech is "performed locally on the device", meaning this kind of data won't be sent to its servers. So, if we're to believe what Facebook says, you don't have to worry about personally-identifying data being captured, but things like your video call length and frequency will be tracked – and if you're already part of the wider Facebook network, chances are you're already okay with that. If not, you might want to consider whether bringing Facebook into your kitchen or living room through the new Portal devices is right for you.